That’s what style consultant David McKnight calls the ill-fitting shirt epidemic plaguing corporate America. “I get rid of shirt fat,” he says. For style gurus such as McKnight, who himself spent 12 years working as a management consultant before starting DAMstyle last March, the recession and its ensuing layoffs have created a niche demand for image-overhaul services. From job seekers looking for the perfect interview attire to executives afflicted with preternatural emotional attachment to their college dress shoes, McKnight’s seen it all. McKnight’s a part of a booming profession, according to The Association of Image Consultants International, which boasts a growing membership of 1,300. 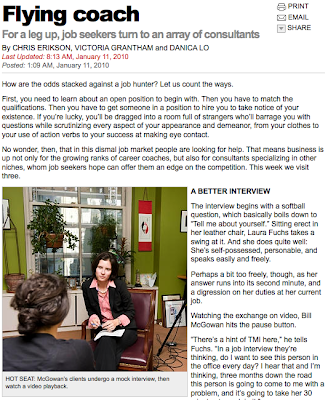 However, instead of furnishing clients with wardrobes full of eveningwear, these days consultant agencies like McKnight’s find themselves on call for job seekers who can’t figure out why they’re not making it to the second round of interviews. Last summer, McKnight began offering a three-hour package for the unemployed. For between $300 and $500, McKnight would critique his client’s appearance, conduct a mock interview and make a set of recommendations designed to improve the client’s professional image. From shirt fat to man bags, it’s tiny details that make the biggest impressions, he says. “One of my clients was unemployed for six months before he came to me,” McKnight says. He knew at first glance that his client’s appearance was destroying his chances. “Wearing a too-big suit shows that someone is unaware of how they’re being perceived — that they’re not focused on details,” McKnight says. He convinced his charge to ditch the canvas messenger bag and pick up a briefcase, swap the soft-soled slip-ons for proper dress shoes, and quit parting his hair in the middle in an effort to conceal his receding hairline. “You’ve got to embrace your baldness,” he advised. After the overhaul, the client got a job in a matter of weeks, McKnight says. Private clients who hire DAMstyle and opt for a more comprehensive package undergo a six-step program that covers everything from wardrobe assessment to body-type analysis to personal shopping services. As a finishing touch, McKnight creates “wardrobe clusters” for his clients — grouping clothing that can be worn together. In addition to client work, McKnight has also appeared as a Tim Gunn-ish den father on an online fashion reality series, writes e-books, and speaks to organizations on the importance of image. And he’s taken full advantage of the social media boom, networking with followers on Twitter (@damstyle), answering style questions and providing 140-character critiques in response to posted photographs.